Where can I find Grating to Sensor Distance for Field 5 in the calculator? If you’re using a standalone DSLR with its own lens (not a telescope), you don’t need to use the calculator. You should use our AD-58 adapter (link). 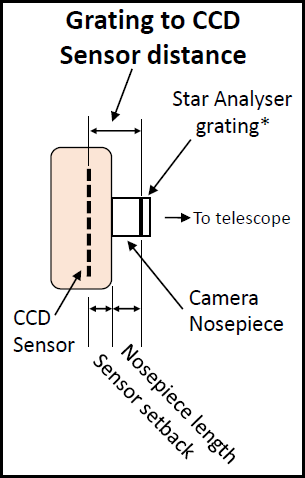 If your camera lens is 35 – 100 mm, use the Star Analyser 200. If your lens is 70 – 200 mm, use the Star Analyser 100. If you’re using your DSLR with your telescope acting as its lens, you’ll need our AD-T2 adapter (link). This adapter places the grating 60 mm from the sensor. Plug this value into field 5. Back focus is 17 mm. The standard nose piece is 33 mm. Add these two and put the result in Field 5. The drawing to the left shows a camera sensor recessed behind the face of the camera enclosure. To measure this distance: Carefully poke a toothpick into the sensor opening and then measure how far in it goes. Sensors are frequently protected by a glass cover plate but be careful not to scratch the plate or the sensor itself. You should use standard static discharge precautions by grounding yourself and the camera, etc. Your measurements don’t have to be exact. For example, don’t worry about eliminating the thickness of any glass cover plate on the sensor. Then add the back focus that you measure to the length of the nose piece (or filter wheel distance). This is the value should put in Field 5 of the calculator. Where can I find Camera Pixel Size and Camera Width for Fields 6 and 7 in the calculator? These values should be available from your camera vendor’s site. For DSLRs, you can lookup your sensor data in this online database: link. Enter your camera into the topmost banner field. Copy the “Pixel Pitch” field in the database results into Field 6 of our calculator. Then scroll down in the database results and copy the first number in the “Sensor Resolution” field to field 7 in our calculator. For example, if the sensor resolution field on the database results screen is 5196 x 3464, copy “5196” to Field 7 in our calculator. For ZWO cameras, see the document linked to above. The highlighted rows in the document contain Pixel Size and Camera Width for each of their cameras. Questions? We’re happy to answer questions. You can text chat live or send us an email from this page: link.